My bike route from Benedum Hall back to my apartment is typically an uneventful, safe ride — a straight shot down Bayard Street until I arrive at my place. Last Friday was different. In total, four vehicles either swerved into my lane or made a right turn in front of me, blocking my path and almost causing a collision. These incidents weren’t due to erratic bicycling. Perhaps they happened because some drivers who shared the road with me disregarded the bike lanes, or because no bike-friendly infrastructure existed in the area other than a chevron-adorned bicycle painted on the road, serving only as a suggestion to share the street. The attitude that some cars harbor toward bike infrastructure is counterproductive. Drivers in Pittsburgh should support the development of bicycle infrastructure in the City, because it will not only make rides safer for cyclists — it will also ensure that bicycles come into less contact with cars, alleviating any stress that drivers face. Pittsburgh is in desperate need of improved bike infrastructure. Until the installation of new bike lanes on Forbes Avenue, there was no safe way to get through Pitt’s campus without a long detour through South Oakland. Outside of the bike path along the Allegheny River and bike lanes along Penn Avenue, there are relatively few ways to get into outlying neighborhoods from Downtown. Pittsburgh could benefit from development in this infrastructure because bike ridership is soaring. Like many cities across the United States, Pittsburgh has experienced an increase in bicycle commuters since 1990. But the trend here is exceptional — in the last 25 years, only Detroit has experienced a larger increase in the percent of commuters who go by bike, and Pittsburgh currently ranks eighth in percent of bicycle commuters at 2.6 percent. In the past, bike lanes have followed wherever there is a demand for them. Portland, Oregon, began expanding its bikeways in the 1980s and ’90s as commuters turned toward biking as a viable commuting option. Since that era, the total length of all bikeways in the city has topped 250 miles, and Portland has the largest share of bike commuters of any U.S. city. Pittsburgh was at 77 miles in 2017, leaving plenty of room to expand. It would not be too costly to develop more bike routes between major neighborhoods. 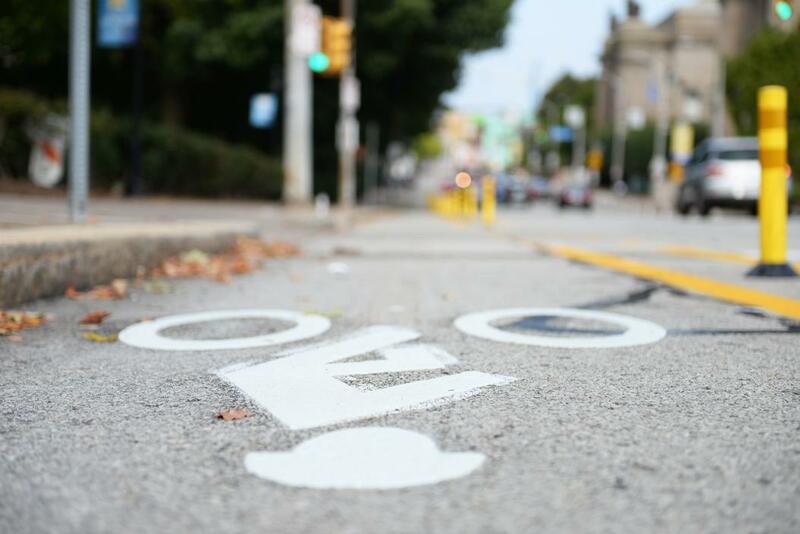 A bike lane costs on average about $100,000 per mile, and given that the City only needs bike lanes connecting major neighborhoods, a full bike lane overhaul in Pittsburgh wouldn’t cost more than a few million dollars spread over several years. This is a relatively small portion of the City’s $529 million expenditure in 2018 alone. In the meantime, bicyclists in Pittsburgh need to make do with the minimal bike infrastructure in place. But even this is difficult when drivers don’t respect what little infrastructure exists. Bikers encounter cars stopped in bike lanes, which force bikes out onto the main road. I frequently see cars at the intersection of Craig and Bayard stopped inside bike boxes, the green rectangles in front of the white stop lines that allow bikes to get a head start at green lights and cross in front of sitting cars to turn left. Both the lack of support and lack of respect for additional bike infrastructure make biking more dangerous. And as cyclists have written before, this encourages bikers to break the law. For example, many bikers feel safer running through a red light when there’s no cross traffic rather than waiting at the light and sharing the undefined lanes of the intersection with cars. I personally break minor laws when I encounter potentially dangerous situations. When cars park on the side of the road, I get onto sidewalks to get out of the way of traffic rather than veering further into the road, something that’s illegal under Pennsylvania law. I also preempt changing lights to get through intersections before someone turns right or pulls a Pittsburgh left — when the first car in the left-turn lane goes before any other car — in front of me. But drivers don’t always understand the thought process behind these minor infractions, and this increases the tension between cars and bikes. As a result, cyclists nationwide often face an undeserved reputation as rule-breakers who don’t care about the safety of others, as evidenced by a recent Washington Post letter to the editor in which a Washington, D.C., resident criticized bikers who commit these small crimes. The easiest way to solve this problem is to build more areas for bikes to minimize contact with cars. This can come in the form of more dedicated bike lanes, or in a stronger form as protected bike lanes, which have some sort of barricade separating the road and bike lane. Pittsburgh’s progressive bike proposals are promising. The bus rapid transit project, which the City expects to complete by 2021, will include a renovation of the current bus lane on Fifth Avenue, transforming it and regions of Uptown into a two-way, protected bike lane providing bike access all the way from I-579 Downtown through campus. But these efforts need the support of both bikers and drivers alike. It’s to the benefit of both that we prioritize the improvement of bike infrastructure.